Sujebi is a traditional soup in Korea consisting of dough flakes that are roughly torn by hand as opposed to being extruded or spun. The flavor and recipe resemble kalguksu but its noodles are made with all purpose flour rather than wheat. It contains hearty vegetables such as zucchini, potatoes, onions, chili peppers and scallions and it's favored on rainy days especially at home. The broth for this soup is usually made with dried anchovies, shellfish and kelp which are all simmered for many hours in order to obtain its rich flavors. 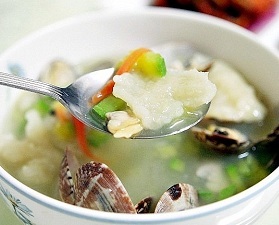 In the past, sujebi was relatively rare and eaten during special occasions such as the celebration of a baby's first birthday. But nowadays, it is considered a typical commoner's food for its simplicity in incredients as well as cost. The name of this dish varies according to regions in Korea and different content variations does exist, containing seafood such as clams and/or shrimps.